Create Mii characters that represent you, your family and friends! Create your own unique characters in Mii Maker, then watch them appear in games and throughout Miiverse! Make a Mii with ease by snapping a photo with the Wii U GamePad camera. Choose a few basic settings to get started, then take a photo and let Mii Maker do the rest! Bring your favourite Mii characters with you! Mii characters created on a Nintendo 3DS family system can be transferred to Wii U. Simply scan a Mii character's QR Code with the GamePad and voila! Mii characters created on Wii can be moved across to Wii U as part of the system transfer process. Save your Mii as a QR Code to share with Wii U and Nintendo 3DS owners. 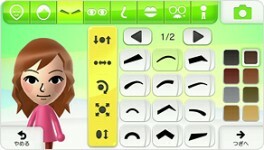 Pick a pose and facial expression for your Mii and make a fun portrait! Please note: an SD Card (sold separately) is required to use this feature. Wii U has room for all your friends and family. Store up to 3,000 Mii characters, including those made in Mii Maker, transferred from Nintendo 3DS or Wii, and from other sources.